OFFICIAL BOOK BLURB: After barely escaping the machinations of his terrifying mother, two all knowing seers, and countless bloodthirsty siblings, the last thing Julius wants to see is another dragon. Unfortunately for him, the only thing more dangerous than being a useless Heartstriker is being a useful one, and now that he’s got an in with the Three Sisters, Julius has become a key pawn in Bethesda the Heartstriker’s gamble to put her clan on top. FORMAT/INFO: One Good Dragon Deserves Another is 463 pages long divided over twenty-one numbered chapters with a prologue and an epilogue. Narration is in the third person via Julius Heartstriker, Chelsie Heartstriker, Marci Novalli, Justin Heartstriker, Estella the Northern Star, and Bob “Brohomir” Heartstriker. This is the second volume of the Heartstriker series. August 1, 2015 will mark the e-book publication of One Good Dragon Deserves Another and it will be self-published by the author. Cover art and design is by Anna Steinbauer. ANALYSIS: Ever since I got my hands on The Spirit Thief, the debut book by Rachel Aaron, I’ve been enchanted by the worlds she imagines and the characters that inhabit them. When she announced this new series, I was very much looking forward to it with a lot of curiosity. After reading Nice Dragons Finish Last, I was thrilled to bits with the new series. 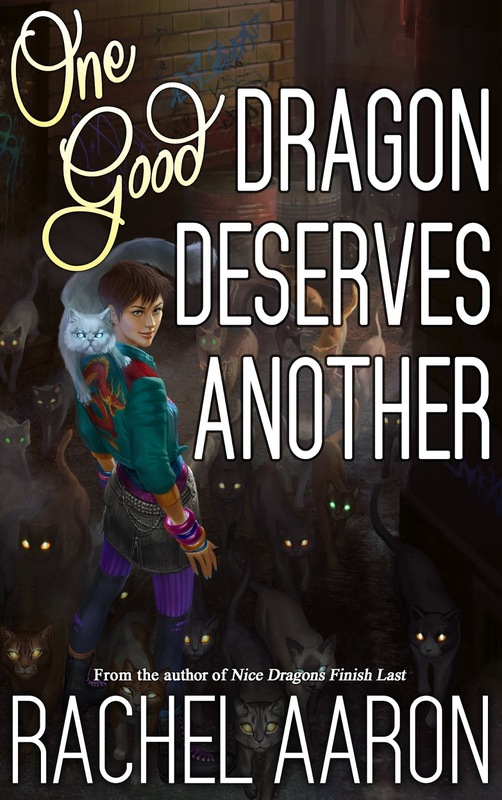 One Good Dragon Deserves Another or OGDDA as the abbreviation goes is the brilliant follow up to Nice Dragons Finish Last (NDFL). It's a cracker of a sequel that basically starts within a month of the climax of NDFL and basically widens up the world, and story in every way possible. I’ll be discussing some plot points of the story which will be spoiler-ish so please be forewarned of it. The plot opens up with Julius and Marci happily forming a partnership and being able to do their job as curse-removal specialists. The problem arises when Bethesda returns to the DFZ and grabs Julius to go with her to a special meeting. Which turns out to be the upcoming nuptials (of sorts) of Ivan Heartstriker and Svena White Witch of the Three sisters. While this happy event is a very perfunctory one, it turns out Bob being a seer has invited a special dragon to this ceremony. That dragon being Amelia, who is the only surviving member of the A clutch and a mighty dragon in herself. While Julius is unaware of who she is, he does get to know her and is bemused by her interest in him. Things however take a horrible turn when Estella, the oldest daughter of the Three sisters returns and hatches a plan to defeat Bob at his seer game. It will be up to Julius, Marci, Bob and the rest to help the Hearstriker clan survive the coming onslaught while also trying to survive Algonquin’s hunter who has a special interest in killing dragons. All of the above and much more is laid bare for the reader and the author truly gives us two protagonists to root for. This time Julius shares the spotlight with Marci who is frankly fantastic as a protagonist. The previous book focused on Julius and while it was a fun read. With OGDDA, Marci takes center stage and we get a stronger, multi-faceted story. The book’s cover kind of highlights this new shift and Marci also learns so much more from her association with Ghost. How and when this happens, is possibly the most surprising twist and only the second most shocking part of the story. The story also focuses on Bob, Justin, Chelsie, Ghost and couple of other major characters. The character cast is suitably widened and I loved this aspect of the story-line. Bob, I believe is a character that is such a hit and in this volume, we get to know more about him and his powers. This just made me love Bob more even when he’s at his most infuriating. There’s also a strong light shined on Chelsie who has so far remained in the shadows and we kind of get an inkling why that is. Lastly the plot reveals the magical history of the world as well as the backstory of the Dragons. This revelation makes so much sense from a world-building point of view and has me intrigued for further exploration. The story takes a suitable dark turn within a few pages of its start and Rachel Aaron does keep the tension evenly strung throughout the story. This book very much reads like a Jeffrey Deaver thriller wherein the entire plot unfolds over two to three days and the twists come left, right & center. This book possibly is the most twisted story-line that Rachel has written so far (among the 10 fiction books she has written so far). I couldn’t quite keep with all the happenings as there’s a seer battle going on as one of them reiterates “you can never be too sure with a seer”. The story unfolds at a wicked pace and the readers will be racing along to find what truly is happening. Lastly while the book ends on a very surprising note, it’s the epilogue that’s the real stunner and I mean it. After all the twists and revelations that the main plot has in it, the last few paragraphs of the epilogue reveal so much more and further deepen the world and magic system so to speak. After finishing the book, I can only imagine the amount of email that Rachel will be getting about the epilogue. As for any drawbacks, this story is definitely not a standalone; one cannot just jump into it. It needs to be read after Nice Dragons Finish Last, so that’s the only point I can think which detracts from this sumptuous thriller. On all other fronts, it aces its characterization, plot twists, plot pace, etc. CONCLUSION: One Good Dragon Deserves Another is a first rate sequel that completely outshines its predecessor in every department. It reads like a thriller, is a urban fantasy, Sci-fi mashup in its plot and is a fantastic read overall. When it comes to books from author that we love, I don’t think we can ask more than that. 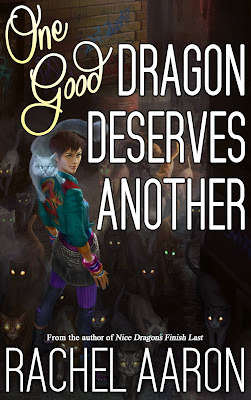 Be sure to read One Good Dragon Deserves Another as it absolutely cements Rachel Aaron's reputation as a gifted storyteller.